You can get almost anything you want at this restaurant, and that's the problem. Noodles & Company's (NASDAQ:NDLS) stock dove 30% last month after the fast-food chain posted weak fourth-quarter results. Shares are now 50% below their IPO launch-day price of $37 per share. The big surprise in the earnings announcement was that comparable-store sales growth came in at just 1.3%, or barely better than what struggling fast-food giant McDonald's achieved. Noodles & Co.'s management claims that progress was made in 2014, including profit growth and gains in its catering business. But I'm not convinced this fast casual eatery has the staying power to expand from its current 440 locations to anything near the 2,500 restaurants it's hoping to ultimately reach. Noodles & Company has a branding weakness that I think makes it a confusing choice for diners. Is it the go-to restaurant for spaghetti and meatballs? Or for curry soup? How about BBQ sandwiches, fruit salads, or pad thai? Serving both Thai and Italian food. Source: Noodles & Company. Management's answer is that Noodles & Company is the place for all of those things. In fact, the company claims "variety" as the key selling point for the brand. Noodles is the fast-casual restaurant for "people with different tastes to enjoy a meal together," according to the annual report. If one member of the family likes Italian while another prefers southern comfort food, you can head over to Noodles & Company and satisfy everyone. The problem is that it's hard to do anything extremely well when you're serving such a wide mix of food. Panera learned that lesson recently and is now busy simplifying its menu. So is McDonald's. In contrast, Chipotle (NYSE:CMG) built its 1,800 store empire on the back of just four tightly connected products: burritos, burrito bowls, tacos, and salads. Looking ahead, Noodles & Company's management thinks advertising can help get sales growth back on track this year by raising awareness of the shop's culinary strengths. Increased marketing investments were the biggest driver behind the profit margin falling by a percentage point to 20% of sales in Q4. The company aims to ramp up spending in 2015 as well, pushing profitability down to as low as 19% this year. We believe the best and most recognizable brands aren't built through advertising or promotional campaigns alone, but rather through deeply held beliefs evident in how a company runs its business. The culture Chipotle referenced can be summed up in its "Food With Integrity" slogan, which references everything from ingredient sourcing to employee training. And that focus hasn't budged since the burrito chain went public almost a decade ago. Noodle's & Company's slogan doesn't have the same resonance. Management articulates the goal as: "Fresh ingredients and flavors from around the world under one roof," which is a reference to that debatable "variety" selling point. Noodle's & Company's slogan, "your world kitchen," reinforces the same idea. 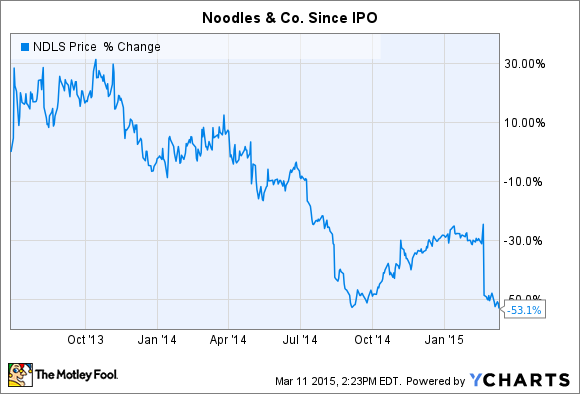 Noodles & Company's comps growth slowed to 0.3% in 2014 from 3.4% the prior year and 5.2% in 2012. That's the company's immediate problem in a nutshell: It can't hope to justify, let alone fund, a big increase in the store base if existing locations are hardly growing. I'm not suggesting the fast-casual restaurant doesn't have room to expand. In fact, Wall Street pros are targeting a 20% sales jump in 2015 to $475 million. Noodles' management is targeting adding more than 50 new locations this year. Still, I don't see a great future for a "variety" concept that should struggle to break through all of the competition. And a bigger advertising budget isn't likely to fix that problem.